Brian T. Higgins received his Juris Doctor degree from Notre Dame Law School in 1979 and his Baccalaureate degree with honors from the University of Pennsylvania in 1976. His current practice areas include automobile liability, general liability and premise liability claims. He is licensed to practice law in the State of New Jersey and in the U.S. District Court for the District of New Jersey. 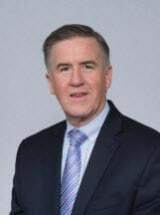 Mr. Higgins is a member of the Bergen County Bar Association and has served as an Arbitrator in Bergen County for over 25 years. He was also a member of the Arbitration Selection Committee in Passaic County, and has served as a Public Defender in the Municipal Courts of the Boroughs of Rutherford and Oakland. Mr. Higgins is also a member of the New Jersey Defense Association. Mr. Higgins served for many years in the New Jersey Mock Trial Program as a competition judge and as a lawyer advisor for St. Mary High School and Northern Highlands High School. He coached St. Mary to Bergen County Championships in 1986 and 1987 and the New Jersey State Championship in 1987, and Northern Highlands to a Bergen County Championship in 2003. Insurance carriers have looked to Foster & Mazzie LLC for their defense needs since 1989. Contact us online or call 973-200-8619. Our lawyers are available in our Totowa office weekdays from 7 a.m. to 7 p.m. (7 a.m. to 5 p.m. on Fridays) and nights, weekends and at our 10 Rockefeller Plaza office by appointment.